"Thank you for providing the perfect platform to introduce the MEMS Foundry message and for hosting such a fine event right here in the heart of Silicon Valley. I was very pleased with the format which allowed plenty of time to spend one-on-one time with past and future customers while sharing our company’s vision of supporting the often overlooked small volume R&D efforts for both new and existing clients. Looking forward to the next two events." "The conference was a very well-organized event. A great agenda of medical wearable sensors, technologies, and manufacturing-related issues. Samtec made several new business and technical contacts with high potential for collaboration! Many thanks to the Microtech Ventures and MEMS Journal team for an excellent forum and networking event!" “In overall, this was a great opportunity for me to overview current status and future challenges of medical wearables. In particular, the great interest and passion for the forthcoming medical wearables were highly impressed, even though the advent of the related market is still sluggish. "Medical Wearable 2018 provided research progresses and business trends in wearable/flexible devices. It helped our startup to get the latest information." "I really enjoyed participating in the conference in the last couple of days. The subjects addressed during the presentations are right on the spot in terms of the challenges and opportunities in the wearable segment. I also enjoyed the opportunity to talk to other players trying to address the same challenges." "Cambridge CMOS Sensors was delighted to present at the Wearable Sensors conference in Santa Clara. The event was a huge success, well attended by key OEMs. It was a perfect setting to learn through in-depth presentations and networking the tremendous development that is taking place in the wearable markets." "The Wearable Sensors and Electronics 2014 conference was an excellent event - well attended by luminaries from both the sensor space and wearables application area. The speakers and speaker topics were very engaging and thought provoking, and there was plenty of valuable networking opportunities at breakfast, lunch, and the cocktail reception - extremely important connections were made for our startup company." "Thanks to MEMS Journal for hosting an excellent conference this week! We really enjoyed all the presentations and the networking." "I am very happy I got a chance to attend Wearable Sensors and Electronics 2015. The conference was very valuable with excellent presentations and opportunities to network with experts and researchers. I certainly hope to attend again next year." "The conference was great. We made some valuable contacts that we are pursuing as a result of the different discussions." "The conference was a very well organized event. A well balanced mixture of different sensor, technology and also material related, high-quality talks. I made several new contacts with high potential for collaboration – excellent networking event! Many thanks to the MEMS Journal team!" "Wireless Sensors and Electronics 2014 far exceeded my expectations. The collection of talks/topics were well thought out and the contents has a lot of information and insight. The networking opportunity was excellent. Congratulations to the organizers and speakers." 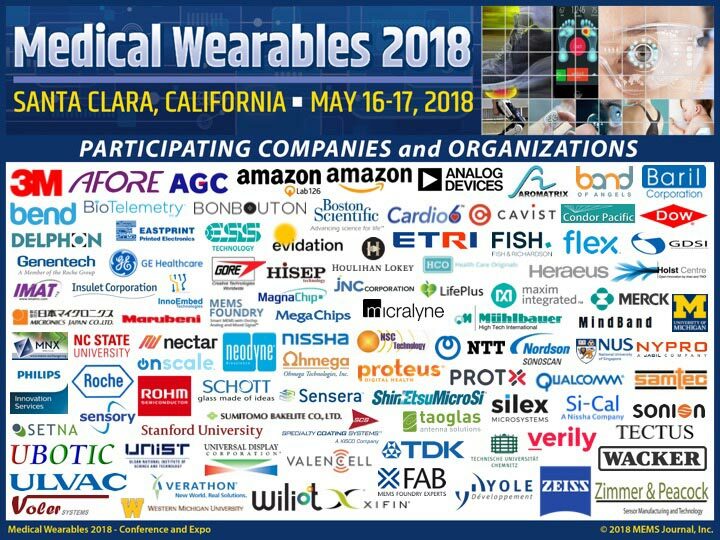 "Wearable Sensors 2015 provides a timely forum for industrial executives and academic researchers to exchange emerging ideas, future opportunities and solutions to the challenges." "The conference was very well organized and the topics presented were very carefully chosen and they had covered a wide range of issues pertinent to wearable sensors and electronics. I could certainly take a great deal of information on broad range of topics from technical design issues to security and legal problems from very knowledgeable speakers. In all, this was among the most informative conferences I have ever attended." "The conference has been very enjoyable and I am glad I participated. Great organization and great attendees." "Excellent mix of technology and application talks coupled with networking opportunities. Nice to see a meeting where such a high proportion of the attendees were present for the entire conference." "Wearable Sensors and Electronics 2015 exceeded my expectations. As a presenter, I was pleased with the caliber of the attendees as well as the other speakers. The program was well planned with informative content. One of the best aspects was the networking opportunity. I look forward to the next event." "It was a great conference that MEMS Journal put together, and they have done a fantastic job selecting the most fascinating and demanding topics in wearable electronics."